to the tailrace of Bonneville Dam was 47.2%, as compared to a 12-year mean survival rate of 39.5%. Snake River yearling spring chinook salmon did well this year, surviving their run down the Federal Columbia River Power System gauntlet toward the Pacific Ocean at a rate exceeded only by the 2006 migration, according to preliminary data compiled in a memo from NOAA Fisheries' Northwest Fisheries Science Center to the agency's Bruce Suzumoto, Northwest Region assistant regional administrator, Hydropower Division. That NOAA Fisheries research record goes back to 1999. The study charts the progress of hatchery fish downstream from the Snake River and tributaries, and from the upper Columbia, via Passive Integrated Transponder tags implanted in the fish. Signals from the tags picked up by detectors up and down the hydro system give researchers information about the fishes' movements and behavior. Spring chinook survival from the head of the reservoir backed up by Lower Granite Dam down to Bonneville Dam during the 2012 migration was 59.6 percent, second on a 14-year record to the 61.2 percent survival recorded in 2006 and nearly 10 percentage points better than the average for the 1999-2012 period. From Lower Granite Dam itself to McNary Dam, survival this year was 5.5 percent better than the long-term average, and 10.3 percent better from McNary down to Bonneville. The survival estimates outlined in the "summer" NOAA Fisheries memo are preliminary. "Our complete detailed analyses and report for the spring migration will be available by the end of the year," the memo said. Final numbers may result in differences of from 3 to 4 percent from the preliminary estimates. Lower Granite is sited in southeastern Washington 107.5 miles from the lower Snake River confluence with the Columbia River. That confluence is located about 325 river miles upstream from the Columbia's mouth at the Pacific Ocean. Bonneville Dam is located at river mile 146 on the lower Columbia and McNary is at river mile 292. In all the Snake River fish climb over eight dams before reaching the Lower Granite pool. In compiling the survival estimates the NOAA Fisheries researchers used data retrieved from more than 20,000 river-run hatchery steelhead, 20,000 wild steelhead and nearly 17,000 wild yearling chinook that had been PIT-tagged for release into the tailrace below Lower Granite. Also used was data from fish PIT-tagged by others for research purposes. Steelhead migrating in-river from the Snake River basin down through the hydro system did nearly as well as the spring chinook. 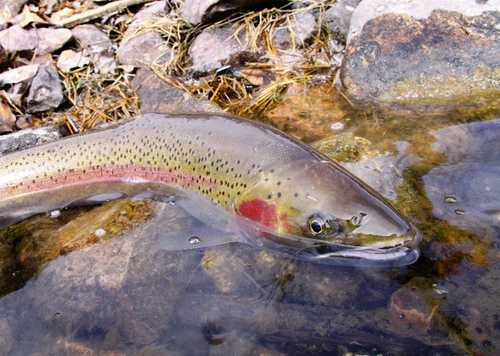 The survival rate for steelhead, 59.8, was the third highest on record and well above the long-term average of 43.1. The highest recorded survival rate was 67.8 in 2008, followed by 61.8 in 2009. The lowest survival on record for steelhead from the top of Lower Granite reservoir down to Bonneville Dam was 3.8 percent in 2001, a year of extreme low flows. Flows from April through September this year were about 102 percent of the 1960-2013 average as measured at Lower Granite, according to NOAA's Northwest River Forecast Center. The timing of the heaviest of those flows could have contributed to the fact that the "estimated percentages of yearling chinook salmon and steelhead transported from Snake River dams in 2012 were the lowest seen in twenty years of our estimates 1993-2012," the memo said. "The pattern through time of flow volume in the Snake River in 2012 was unique among the last eight migration seasons, in that the highest peak in flow occurred in late April rather than in May, and in fact the flow throughout May was no higher than in early April," the NOAA Fisheries memo says. "The overall average of daily average flow volume was higher in 2012 than in the long-term series, but no other year's flow pattern had those characteristics." Snake River flow fluctuated around 100,000 cubic feet per second for the first three weeks of April and, increased quickly to the season peak of 178 kcfs on April 27, and decreased over the next week back to around 100 kcfs, the preliminary analysis says. "Mean spill volume at the Snake River dams in 2012 was nearly equal the 2006-2011 average for the first three weeks of April and then jumped to a very high peak during the spike in flow volume. In terms of percentage of flow that was spilled, the first three weeks of April 2012 were below the average of recent years, jumped to near 50 percent during the spike in flow, and then returned to near-to-below average for the month of May," the memo says. "Water temperatures in the Snake River in 2012 were near average for most of the season. Water temperature increased relative to average during the spike in flow." "Collection for transportation began on 2 May at Lower Granite Dam, 4 May at Little Goose Dam, and 6 May at Lower Monumental Dam," according to the memo. Strategies intended to aid downstream salmon migration include those trigger points when collection of the young fish through mechanical means begins at three dams on the lower Snake and at McNary. The idea is to collect fish and steer them onto barges for transportation downstream through the hydro system, thereby avoiding repeated dam passage, predators, unkind environmental conditions and other potentially negative impacts on survival. Transported fish are released below Bonneville, the lowermost dam in the river system. In-river migration includes dam passage through specially-designed mechanical systems, the spill gates or through power generating turbines. "However, a large spike in smolt passage was associated with the large spike in flow in late April, resulting in a large percentage of smolts (about 67 percent of yearling chinook and 59 percent of steelhead) passing Lower Granite Dam before transportation began," the memo says. "Throughout the migration season, high spill percentages, in combination with surface bypass collection at each of the collector dams on the Snake River, resulted in low proportions of fish entering juvenile bypass systems. "During the period of general transportation in May, about 60 percent of smolts that arrived at Lower Granite Dam were transported from a collector dam. These relatively low collection rates and a late start in collection relative to run timing resulted in low proportions transported in 2012. "Our preliminary estimates of the proportion transported of non-tagged wild and hatchery spring-summer chinook salmon smolts are 22.7 percent and 24.7 percent, respectively. For steelhead, the estimates are 28.4 percent and 26.7 percent for wild and hatchery smolts, respectively. These estimates represent the proportion of smolts that arrived at Lower Granite Dam that were subsequently transported, either from Lower Granite Dam or from one of the downstream collector dams." Estimated survival in 2012 of Snake River sockeye salmon (hatchery and wild combined) from the tailrace of Lower Granite Dam to the tailrace of Bonneville Dam was 47.2 percent, as compared to a 12-year mean survival rate of 39.5 percent. Estimated survival in 2012 of Columbia River sockeye salmon (hatchery and wild combined) from the tailrace of Rock Island Dam on the mid-Columbia to the tailrace of Bonneville Dam was 79.4 percent, compared to an average of 54.1 percent.